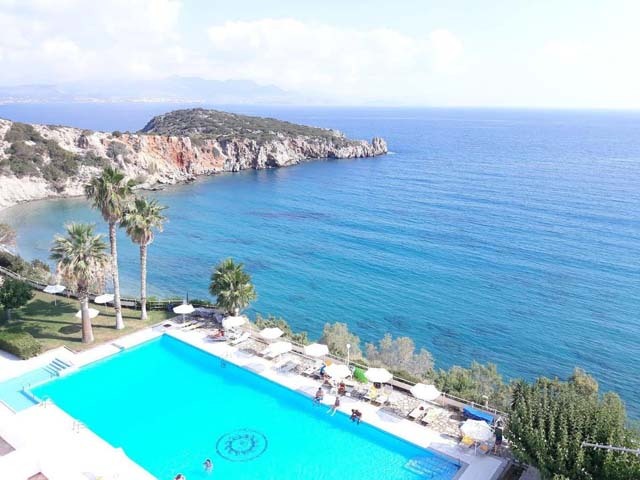 In one of Greece's most beautiful bays lays the Istron Bay Hotel, a Hotel that has inspired innumerable artists, writers, poets, politicians and journalists and most of all Istron Bay guests. A work of art, the Hotel is protected from the eyes, intrusions and noise of other visitors to one of the Mediterranean's most popular Resorts. The bright white of its buildings combines perfectly with the tropical green of the gardens, the fierce purples and reds of the bougainvillea and hibiscus, the million blues of the Mirabello Sea. 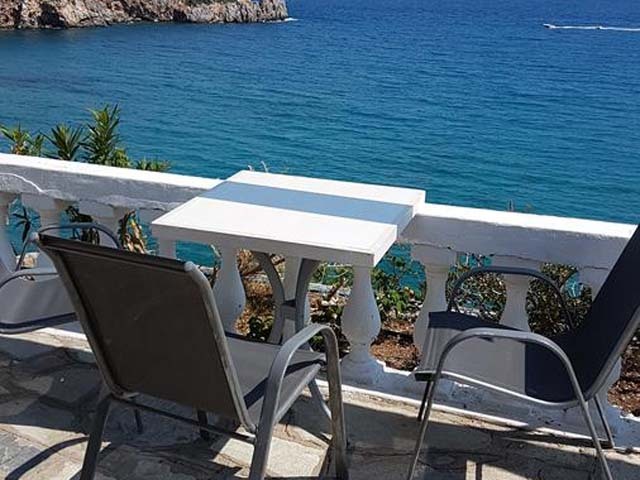 There is no other place on earth with such beautiful sea colours, stated "The Eleftherotipia", a major national Newspaper. This sea becomes a part of you, as you cannot escape the blue canvas. In the Bedrooms, the Restaurants, the Gardens, the Bars, the Pool - even the Tennis Court - the sea moves in your mind, melts in your soul, soothes your cells, removes the aches of hard city life, even the fatigue of more divine duties. This is why Istron Bay is called "The Refuge of Gods". Surrounded by a carpet of wild nature, olive groves, orange and lemon trees, even the majestic palm trees and vegetable gardens of Istron Bay, Istron Villas are settled on a hill blending magnificently with the landscape. 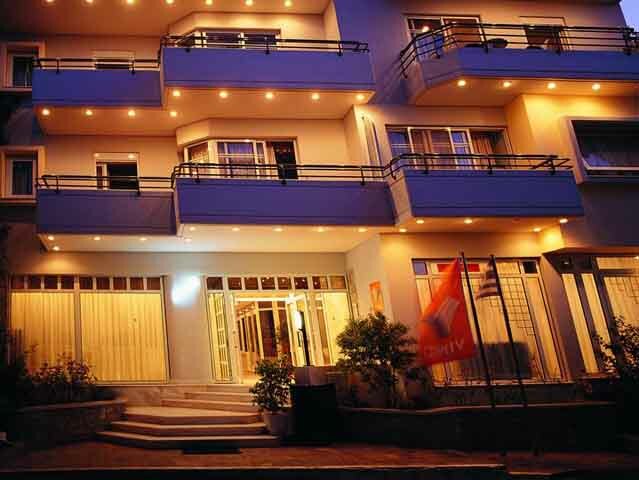 The property shares the same bay with Istron Bay Hotel offering an ideal combination. Guests can run their own villa, keeping their privacy and independence and at the same time enjoy the facilities of a stay in a luxury hotel, which is within walking distance, yet far enough to protect the villa residents from any disturbance. 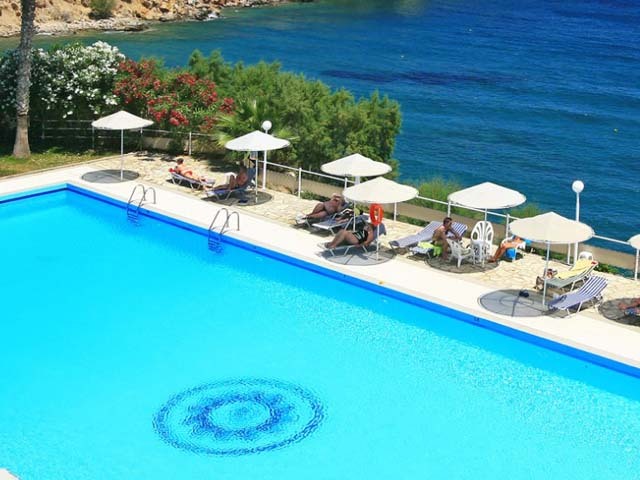 Situated on the north and Eastern coast of Crete, Istron Bay Hotel and Istron Villas are located 13 km from the famous Resort of Agios Nikolaos, 800 metres from the Istron village, 70 km from Heraklion Airport and Port, 22 km from the most southern Town of Europe Ierapetra and 64 km from Sitia at the eastern end of the Island, all easily accessible by bus. There is a Bus Stop just outside the Hotel. 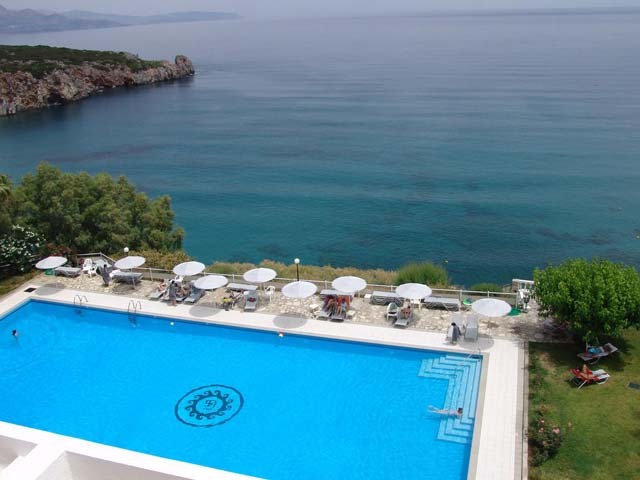 The Hotel consists of 60 Standard Rooms - Seafront with Sea View, 43 Superior Rooms with Sea View, 15 Suites/Apartments - Seafront with Sea/Garden View, by the Pool, 27 Garden Junior Suites - Seafront with Sea/Garden View and 5 Self-catering Villas - Niovi, Daphne, Phaedra and Artemis each one possessing its own pool. 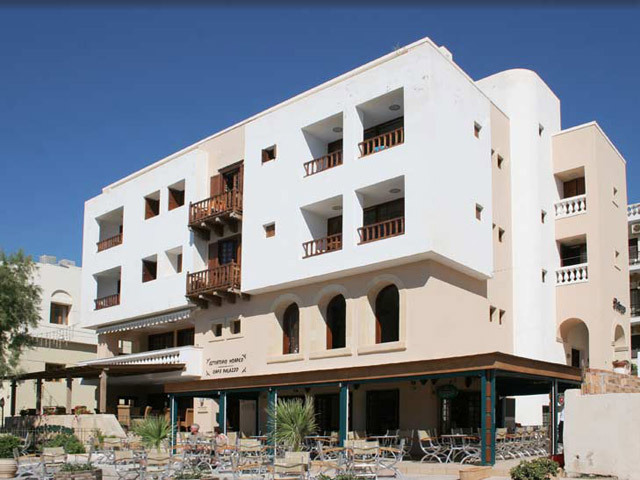 The 60 Standard Rooms have a magnificent sea view and a Balcony/Terrace. The 43 Superior Rooms are larger Rooms on higher levels. 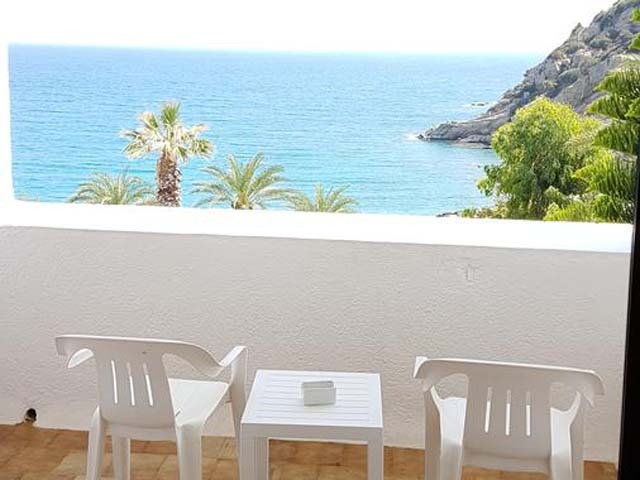 All have a Bedroom area and a Sitting area, sea view and open-air Balcony/Terrace. There are 15 Suites/Apartments with two Rooms and Bathroom, Kitchenette and Refrigerator, sea view open-air Balcony/Terrace. 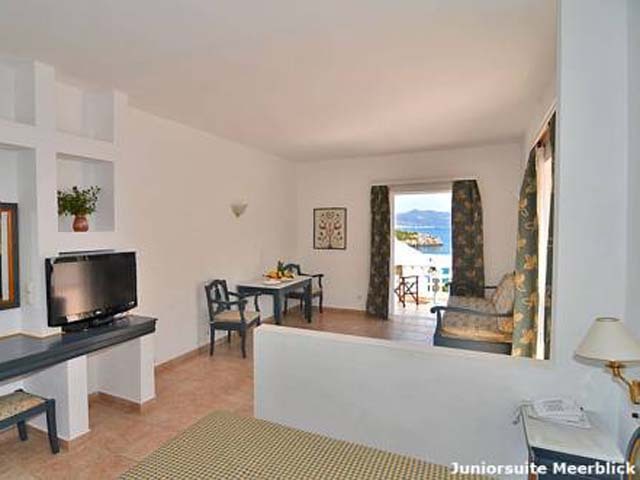 There are 27 Garden Junior Suites near the Sea, with either Sea or Garden View - Sea View from the Terrace. These are larger Rooms, 5.3m-7.0m x 4.0m with Bedroom area and Sitting area, designed to accommodate four people, or five in the larger ones. 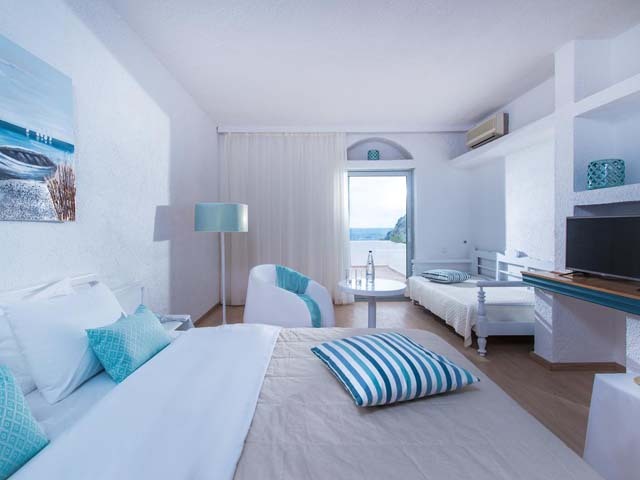 All the Suites are furnished in a modern Aegean style and include a Bathroom and Bathrobes. Furthermore, the open-air Balcony/Terrace comes with Sun Loungers to enjoy the sun in all possible comfort. Entering the villas makes it apparent that no cost has been spared in order to create a feeling of ‘‘being home’’. Modern and antique furniture from the hotel's collection creates an atmosphere of under-stated elegance while contemporary technology completes the comfort. Each Villa occupies a different level with shades and fences having been carefully designed to secure privacy. 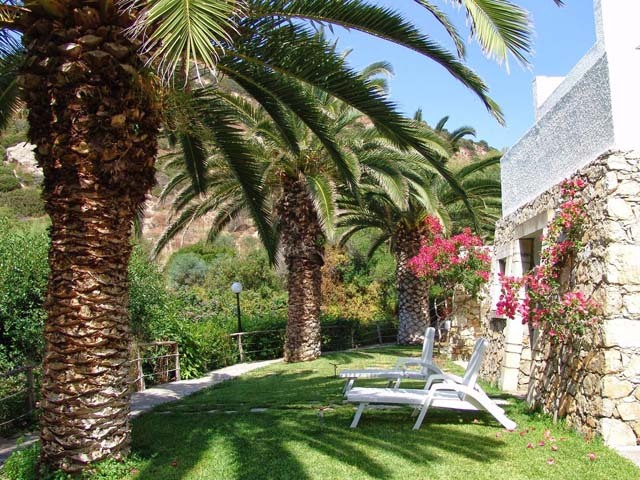 All villas has a large terrace either stone-flagged or tiled, with a private pool (except Alkistis) framed with marble. A marble topped-table and benches serves for alfresco dining. 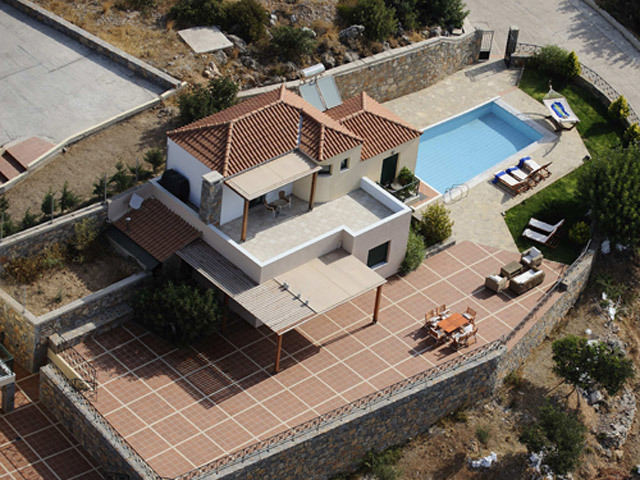 Artemis: The villa on top of the complex, is a three-bedroom villa with a private pool 8mΧ4m. 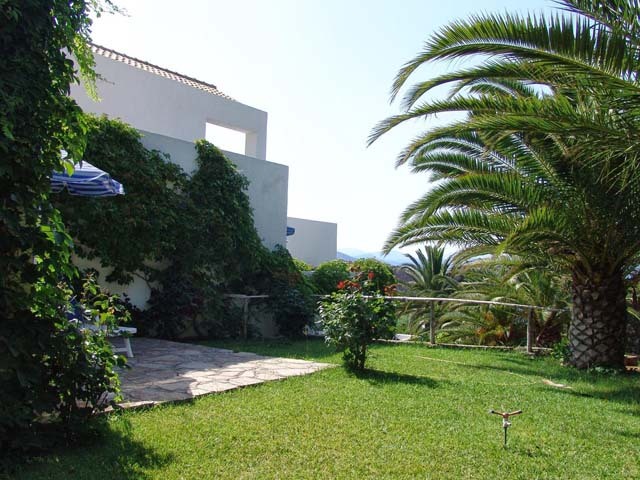 Total area 101 m2, living room 30 m2, three bathrooms, two of them en suite and large terrace 140 m2. A bathroom corresponds to each bedroom, master bedrooms have bathroom en suite. All kitchens are equipped with full oven, fridge-freezer, microwave, toaster and coffee maker. 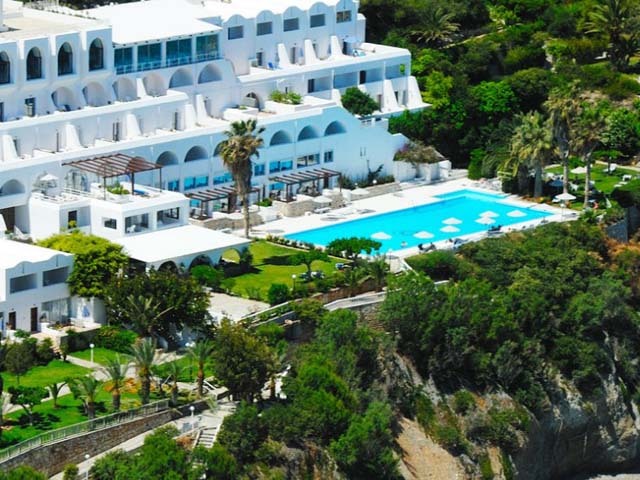 The Hotel is surrounded by 20,000 m2 of gardens, creating a magical atmosphere and spectacular scenery; a remarkable pleasure for your eyes while enjoying the sun on the Sun Terraces overlooking the Bay. 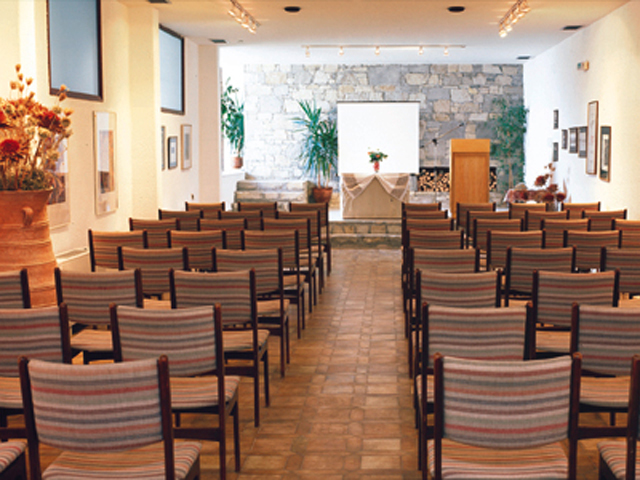 2 Conference Rooms Ariadni with 120 seats & Mithekos with 45 seats. Of course, the sea is the perfect environment for Water Sports. You can select between Water-skiing, Windsurfing, a ride with Pedalos or Canoes or maybe something more relaxing like Fishing. Moreover, if you are ready for some underwater activity, you will be pleased to find that a fully organized first class Diving Centre operating in Istron Bay. Disco Dancing Lessons, Video & Slide Presentations, etc. During the day the Animators will try, their best to keep you busy through Aerobics, Gymnastics and Stretching classes. They also organize some Beach Games, especially Beach Volley Tournaments, as well as Pool Games. If you prefer something, less tiring you can go on the occasional Fishing Trips or maybe join a group for Nature Walks. Alternatively, you could choose to learn the Greek Language and take some Greek Lessons, or perhaps some Dancing Lessons. As far as your children are concerned, the Animators offer a complete Children's Daily Programme. One of the advantages of Istron Bay is the location in the centre of the "green district" of Crete: Nature in its purest form, blue sea, Minoan sites and Byzantine Churches merge in a most exciting landscape, enhanced by the culture of the Cretan People, the strong, almost metaphysical connection of the Cretan with Nature, God, and Life. Just some of the Hiking possibilities include visits to Faneromeni Monastery, to Gournia antiquities, to Vrocastro - Minoan Castle, to the old village Kalo Chorio not to mention a large variety of exciting trips for the experienced walkers. 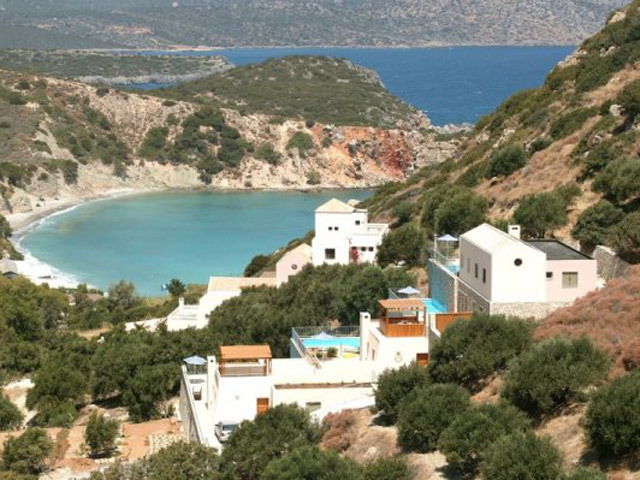 The Hotel organizes a Botanical Tour, Picnic, and a visit to Kalo Chorio. No Hotel would be complete without a respectable Dining Room. It serves Breakfast and Dinner. The Breakfast Buffet offers an extended English style Breakfast with whole food products. 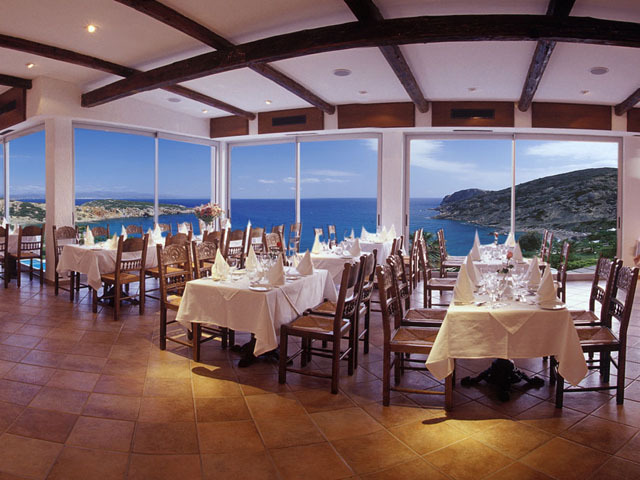 Dinner offers salad and dessert buffet, soup, buffet of traditional Cretan appetizers, a main course and table service. Once every fortnight, a grand Buffet, a Barbecue with Greek Entertainment and Gala Candlelight Dinner without extra charge is offered. Children's and Vegetarian menus are also available. The Dining Room is large enough to accommodate all the guests at one sitting. If you have something different in mind you can always try the Cafe-Bistro by the Pool. It serves a large variety of snacks, spaghetti, salads, sandwiches, ice cream and pastries. It stays open until dinnertime. Your options are not that limited though. 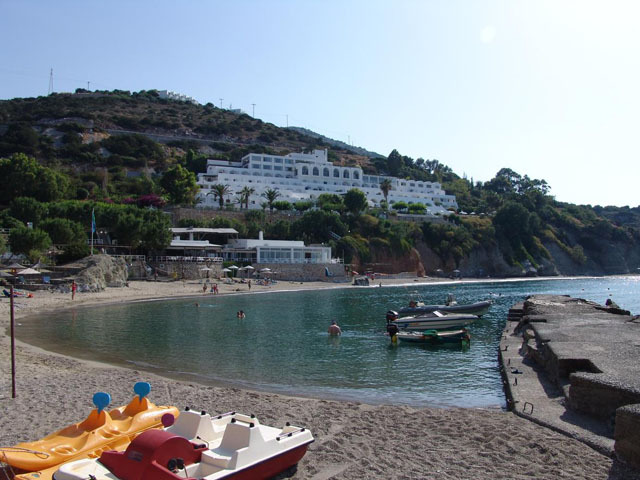 There is also the Beach Taverna Votsala. 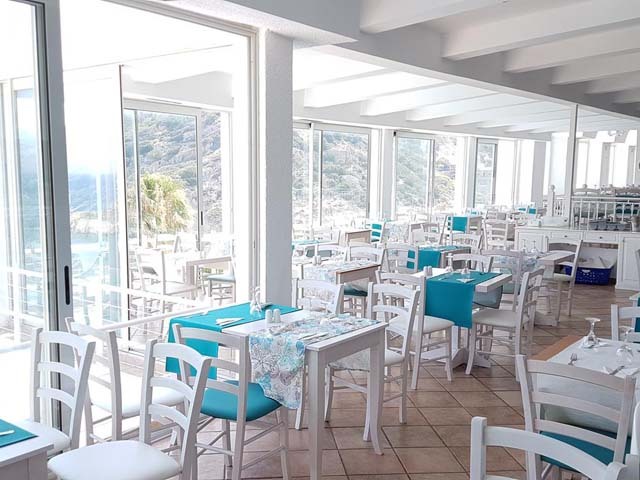 It is open for lunch with an extended menu of Greek and Mediterranean delicacies, a separate fruit and Cocktail Bar. Finally, you can visit the a la Carte Beach Restaurant Meltemi, which is always open for dinner. It combines atmosphere, entertainment and good cuisine - fresh fish, lobster, Chateaubriand etc. Guests are refunded the cost of their half board meal if they wish to dine there. On the other hand, of course, if you just feel too lazy, you can safely rely on the Room Service serving drinks, snacks, pastries and breakfast, even meals from 07.30 to 02.00. If you are wandering about your evening entertainment, visit the Main Bar, open every night, with a pianist once or twice a week. Its Terrace, the Moon Terrace, as it is called, is one of the most popular spots of the Hotel. If you feel like staying close to the Beach then you can visit the Beach Bar that stays open during the daytime and well into the night. Finally, there is the Open-air Disco, for the younger guests. Its operation depends completely on the population of the younger age group. Entertainment area for the adults is the dance floor at Meltemi. Another reason for the Hotel to be proud is the cuisine; Istron Bay is synonymous with traditional Cretan and Mediterranean Cuisine. The national campaign for the implementation of traditional cuisine was decided and partly run in the Hotel. 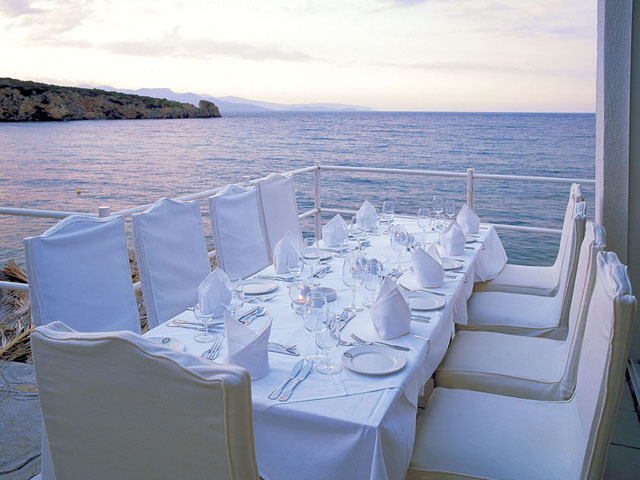 Today, the Hotel is a pioneer in implementing the traditional and creating contemporary Greek cuisine. Cretan traditional cuisine is the main alternative in the half board meals. 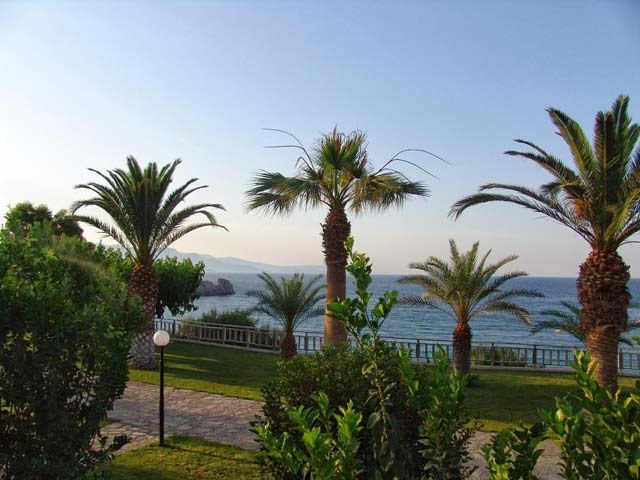 You may also experience Mediterranean tastes in the Beach Restaurants Votsala & Meltemi and the Pool Bistro Finikas. The Gastronomic Animation Programme offers an opportunity to learn more about healthy cuisine and to make it a part of your lifestyle. 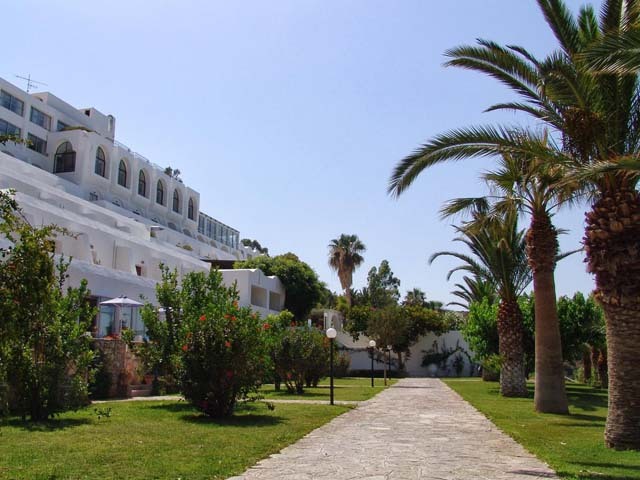 It includes a Botanical Tour with picnic, a series of Cretan Cooking Lessons and a Grand Buffet with a presentation of the traditional Cretan cuisine. Among other things, you will have the experience of tasting aromatic Mountain Teas and Wine Tasting, as well as the opportunity to learn how to make spreads with olive oil and yoghurt. 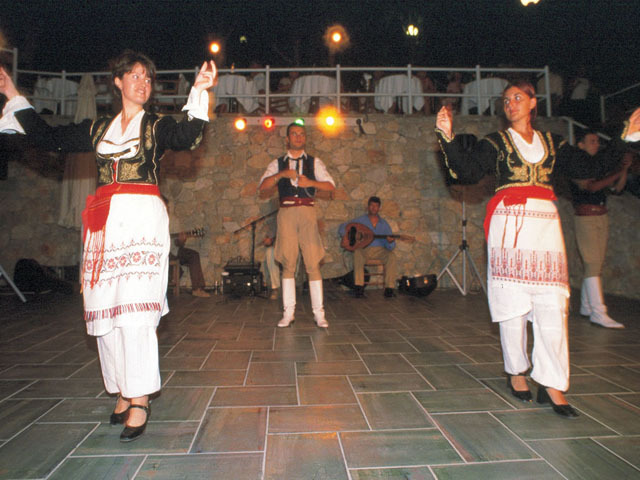 Of course, a good meal must also be accompanied by the appropriate music, so Cretan Music and Traditional Dancing is included in the programme. It is said that the Mediterranean cuisine is one of the very best in the world. You are welcome to try it at any time! Open: May - October... 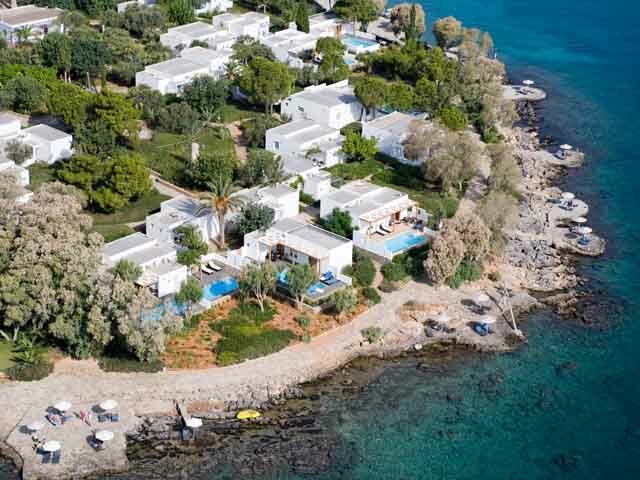 In one of Greece's most beautiful bays lays the Istron Bay Hotel, a Hotel that has inspired innumerable artists, writers, poets, politicians and journalists and most of all Istron Bay guests.